Daniel and AnnaMarie Miller Family: Ya Big BABY! You know that constant battle/dilemma we all have as parents? The one where you need to go out- you have things to do- but your child will inevitably fall asleep 5 minutes before you get home, then wake up when you carry them into the house and totally miss the rest of their nap? My kids stopped napping very early. My first 3 that is. I was so sad when about their 2nd birthdays, they decided they no longer needed naps. Other parents would talk about their 4 year olds napping and I had no idea what that would be like. I just wanted them to take a nap! But they outgrew themso very early. Then along came my Jayden. He is the baby of the family in so many ways. It's as if part of him knows that, and is perfectly content not growing up. While Jaxon came out of the womb ready to attack the world all on his own, Jayden loves being babied. He will insist he is BIG but he still wants to be carried, held, spoiled, waited on and snuggled. So remember that dilemma I was talking about? We don't have that with our Jayden. 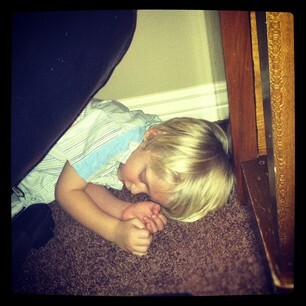 That sweet little guy can sleep any time, anywhere. Afternoon hits, his little body just decides it's ready to sleep and out he goes- no matter where we are or what we are doing.